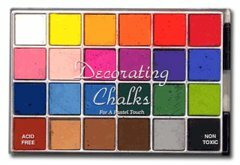 Quality, acid-free chalks help you add the artists touch to your scrapbook pages. Apply a hint of color to die cuts, background paper, photos and lettering. Great for accenting die cuts and lettering. Excellent for highlighting and accenting your favorite craft, photo tinting, ceramics, rubber stamp, card making, scrapbook layouts, and more.This supplemental pallet of pastels complements the multi-colored basic pallet. Like the basic pallet, the pastels are long-lasting and safe in their sturdy plastic case. 24 pack comes with two applicators.